I deleted my Facebook on June 10th 2016, and upon this event—now that I sense the irony of it—I decided to tweet about it. I jumped from one network to the other, without really realizing that both profit off of selling my behavioral data regardless. Even Twitter makes money off of ads and behavioral data, but nothing comes close to Facebook. Even Google does not come close to what Facebook knows about certain aspects of its users, and how it has the capability to manipulate them psychologically.1 In her book Weapons of Math Destruction, Cathy O’Neil talks much about these systems. Now that Facebook owns Instagram and WhatsApp, I have continued my move away from these services. Summer is the perfect time for me to do these moves, since I no longer rely on communications as much as I do during other times of the year. As of now, I have no Facebook-owned apps installed on my phone, because I feel no urge to sell my data in exchange for a manipulative service. Especially since there are plenty of other alternatives. But I have to say, it is hard to be without Instagram because I no longer see what my friends are up to. Maybe this is a good thing. But it would still be nice to have the ability to have access to the feeds of my friends without being exploited by Facebook. So first thing we have to do is get a list of usernames that we follow. There are plenty ways of doing this. Assuming that you don’t follow more 10000’s of accounts, the best way is to go to the web version of Instagram and click on the Following button to get a list of those who you follow. Here we have a list of users that we follow. 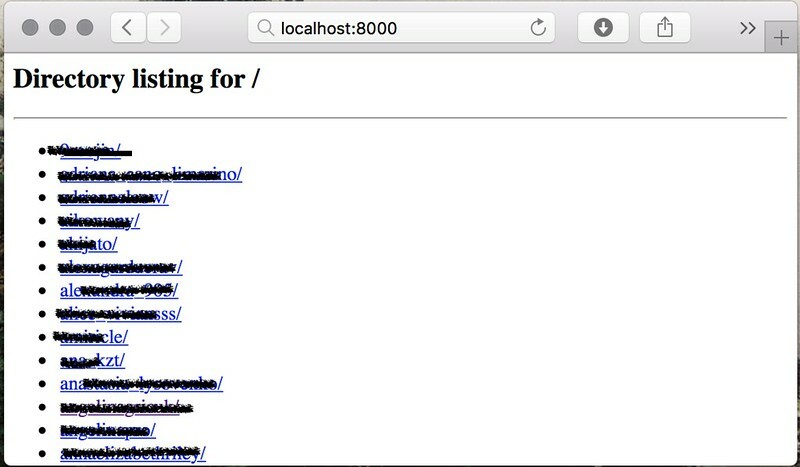 Now we want to inspect each HTML element and find out the name of its HTML class. On Mac, we can press Command+Option+I to bring up the HTML inspector. By bringing the inspector, we can find out the HTML class name of each username element. Now that we have the name of the HTML class which represents the usernames that we want, we need to output all the usernames into a list. In this particular example, the HTML class called _4zhc5 is the one that represents the username text that we need to output into a list. Like so, then press Enter. Now we can paste the main script which will download a text file to our Downloads folder. Remember to substitute _4zhc5 with whatever HTML class name that represents usernames. text += list[i].innerText + " \n"
Copy and paste this script into the console just like the previous one. This is quite nice since we can now use this list to scrape the Instagram accounts of these listed usernames. Option -n tells the instagram-scraper command to create folders for each username instead of dumping all images into my-instagram folder. Option -d specifies the destination to which we want to scrape our content. In this case it is ~/my-instagram where the ~/ specifies that it is located in your home directory. 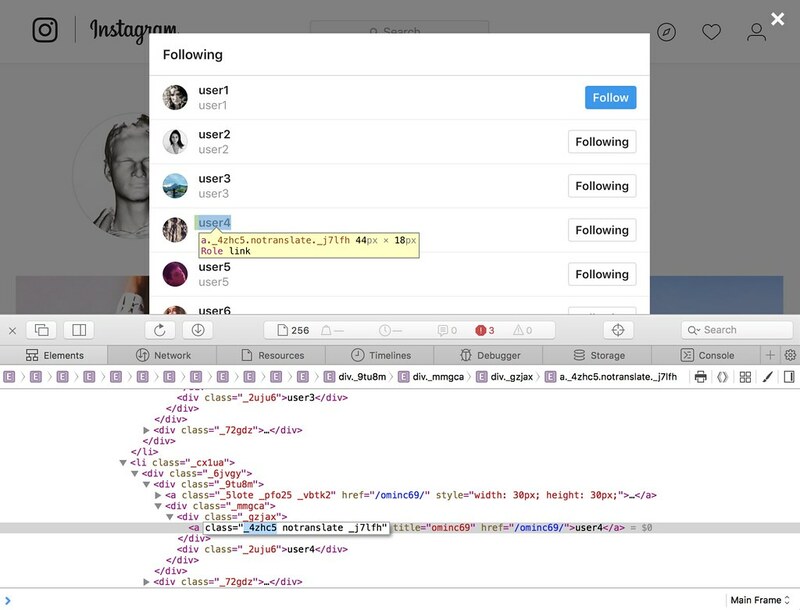 Option -f specifies the file path to our insta-following-list.txt. Find the path to this file, an paste it. On Mac, it should be ~/Downloads/insta-following-list.txt. The option -l signifies not to start script unless your login is successfully authenticated. This command is only necessary if you want to scrape private accounts. If you want to scrape only public accounts, use the command without -l and everything after it. Option -uspecifies your Instagram username. Paste this without any quotes by replacing your-username. Option -pspecifies your Instagram password. Paste this without any quotes by replacing your-password. Note: There might be some problems with the script while it attempts to login into your Instagram account. Try resting your Instagram password and retry the command with the new password. This usually solves the problem. 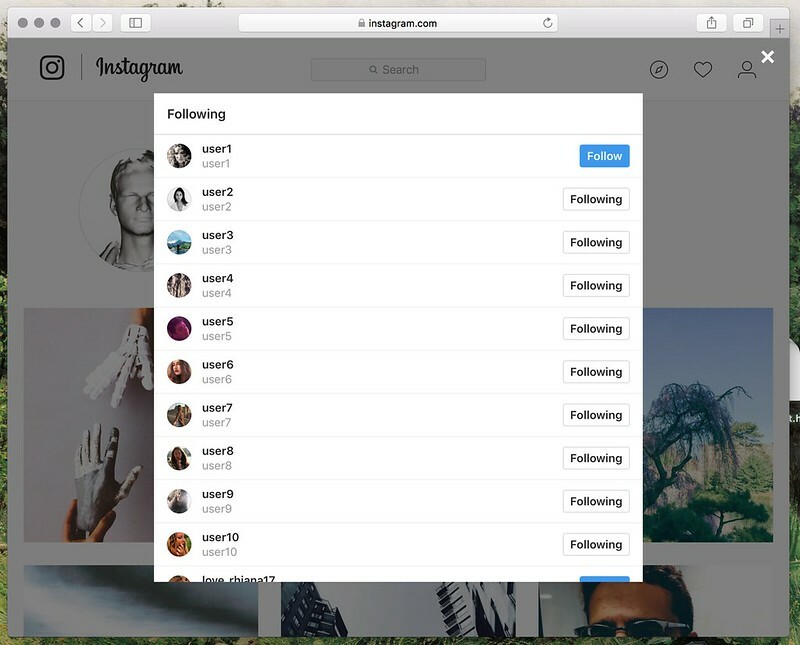 Now you have the Instagram content of all your usernames on your hard drive. Now that we scraped all these images, what is the point if they are just stored on our computer? We can create a Browsable web-gallery using a script called gallery_shell. 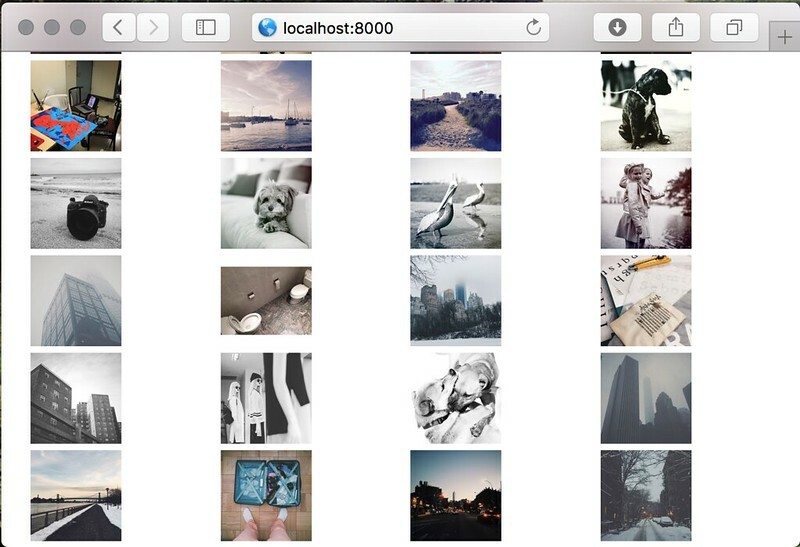 Once you click on ant of these links, you’ll see a thumbnail gallery for each username, including private accounts if you chose to include your Instagram credentials. This is not exactly a copy of Instagram and looks more like a hack, but it is a very great way to continue using Instagram without being subservient to the systems owned by Facebook. Plus, you will be able to backup Instagram Stories which disappear from Instagram after 24 hours. For the next blog, We’ll be looking at how to setup an Instagram backing up process.